Perfect for Trucking Lines, Transportation Industry, Shipping Organizations and Moving Companies to name a few. 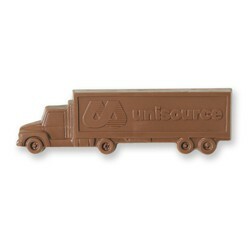 The imprint area on the truck is 3 1/2" x 1"
ÃƒÂ¢Ã¢â€šÂ¬Ã‚Â¢ Custom Mold Charges are Additional. See Options Tab for Additional Imprint Options and Pricing. ÃƒÂ¢Ã¢â€šÂ¬Ã‚Â¢ Shelf-life: Our Kosher Certified Premium Swiss Chocolate products have a shelf-life of one year if properly stored at room temperature. ÃƒÂ¢Ã¢â€šÂ¬Ã‚Â¢ Packaging: Clear Top Gift Box. Gold or Silver Box Upgrades Available. Hotstamp Options Available, See Options for Details.